The undisputed King of the Blues returns to Blu-ray this July. In an early announcement to retailers, Image Entertainment has lined up 'B.B. 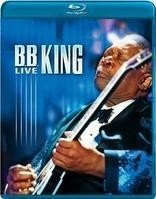 King Live' for Blu-ray on July 12. The man needs no introduction. Truly the reigning king of blues, over the last 60 years B.B. King has developed one of the world's most identifiable guitar styles and has influenced thousands of musicians. Known for integrating precise and complex string bends with left hand vibrato, King has a uniquely regal and velvety tone making every note count. With trademark Gibson “Lucille” settled on his lap, B.B. King presents a concert filled with staggering guitar jams on hits like “The Thrill Is Gone” and “Downhearted.” In between songs, King’s characteristic affable persona shines through as he introduces the band he’s always toured with and shares stories from his life. Throughout the show special guests Terrence Howard, Solange, and guitarist Richie Sambora stop by to jam and pay tribute to this renowned blues master. Don’t miss legend B.B. King performing in his element in this amazing concert! Song List: Everyday I Have the Blues, See That My Grave Is Kept Clean , How Many More Years, Downhearted, I Need You So, I Got Some Help I Don’t Need, Thrill is Gone, Nobody Loves Me But My Mother, Let the Good Times Roll, Thrill is Gone, When The Saints Go Marching In, Key to the Highway. Suggested list price for the Blu-ray will be $17.97. You can find the latest specs for 'B.B. King Live' linked from our Blu-ray Release Schedule, where it is indexed under July 12.